A businessman (the baby faced Chris Pine) returns home after his estranged father’s death and discovers that he has an alcoholic sisterwith a 12-year-old son. He is forced to reexamine his own life while trying to form new bonds with his family. 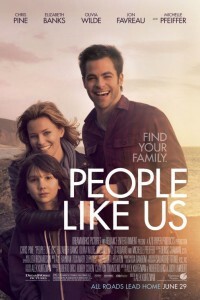 Originally entitled Welcome To People, the movie People Like Us is a drama about a young businessman (Chris Pine) who returns home after his estranged father’s sudden death, only to uncover a devastating family secret, which sends him on an unexpected journey of self-discovery. People Like Us is the directorial debut of Alex Kurtzman (writer of Transformers and the 2010 Star Trek). He also with wrote the movie with his writing partner Roberto Orci. Whoever came up with the original title Welcome To People need to have theirheads examined. It doesn’t take a genius to predict that this movie, People Like Us, will be sh*t out of luck at the movie box office, most likely one of the biggest bombs at the 2012 movie box office. And these executives green light movies like this trash… how do they keep their jobs?